Safety first – this motto has become a dictum. And with good reason. Promotional items for occupational safety are not only indispensable and effective as advertising, but also provide the necessary protection during all work-related activities, both in-house and underway. You will love our “Occupational Safety & Protection” section, because our promotional items for occupational safety cover every conceivable requirement. In the occupational safety & protection field, promotional items are less gifts than obligatory work accessories, some of which are even prescribed by law. Nevertheless, textiles can still be transformed into mobile advertisements for your company by using an imprint, e.g. in the form of a unique advertising slogan or company logo. Work clothing is not your typical promotional give-away. However, it is the ideal promotional gift for company anniversaries or other occasions. Competitions are also a good way to distribute promotional gifts with a great advertising effect. 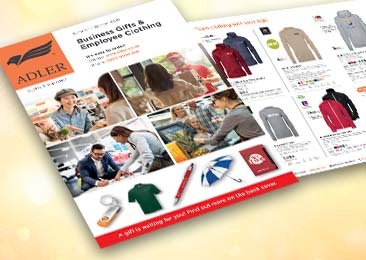 If you plan your advertising precisely and make targeted decisions when shopping at ADLER, you will find an astonishing range of promotional items and team wear that is perfect for advertising your products and services at a low cost. Our motto: It’s all about the right concept! Every give-away needs to be carefully thought-out, as does work clothing in general. With the help and advice of our advertising experts, you will be on the safe side when it comes to promotional items for occupational safety. We can inform you about everything you need to know about promotional textiles and work clothing. The product details provide reliable information about quality and your personalisation options. Work clothing can be stylish! Depending on your sector, promotional items for occupational safety can even serve as a form of merchandising. For example, overalls are a form of work clothing that serve to protect their wearer. In addition, some innovative companies have a kind of cult following, so that work wear featuring their company logo is very fashionable and popular. Company clothing has thus changed considerably in recent years. Keep your customers coming back for more with business gifts in the form of personalised teamwear. And your employees will love receiving work wear that is both stylish and safe. Find out exactly which promotional items for occupational safety are suitable for your needs. Some products from the ADLER business gift shop are suitable for all target groups, while others are more specific in nature. The same is true of personalised textiles if your business is in the trades sector. Bear in mind, when it comes to promotional clothing, that not every type of personalisation is possible. We are here to help you choose the promotional items that meet the relevant occupational safety regulations. Safe, stylish work wear will bring you closer to your customers and employees! With the right professional teamwear nothing will stand in the way of your success!